Spring is a good time to pick nettles for cooking with. They are lush and tender and full of sweetness. I like to use them as a wild alternative to our more typical cultivated spring greens. They’re just as delicious as spinach and, like kale, should be considered a super food as they are incredibly good for you. 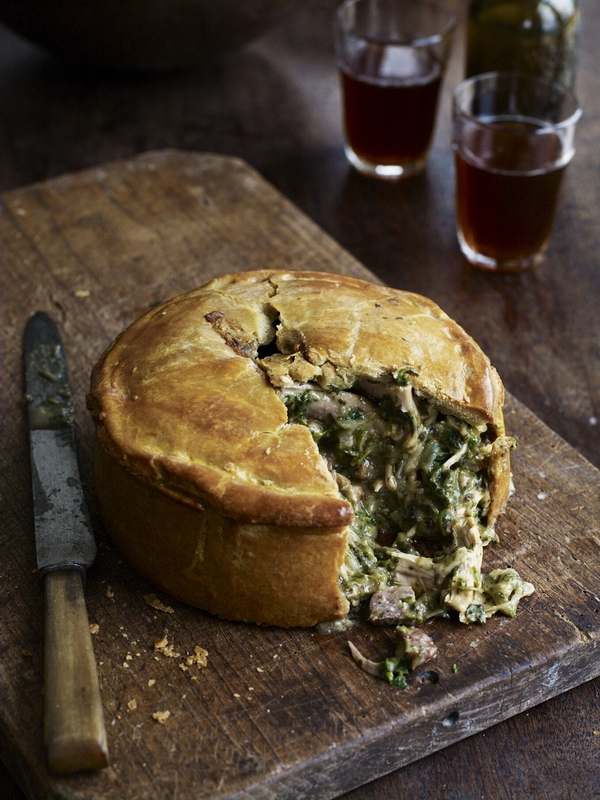 This rustic pie shows off the nettles affinity with chicken. It’s superb warm from the oven, but equally good cold, as part of a spring picnic perhaps. Place the flour in a bowl, add the cold butter and rub through with your fingers until you have a mixture the texture of fine bread crumbs. Add the salt and enough water to bring together into a pliable dough. Wrap in cling film and refrigerate. Bring a large pan of salted water to the boil, add the nettles and cook for 1 – 2 minutes drain and plunge into cold water to stop them cooking and to keep their nice green colour. Drain well and set aside. Meanwhile place a medium/large heavy based saucepan over a medium heat. Add the olive oil and when hot throw in the bacon lardons. Cook, stirring occasionally until the fat is rendering and it’s beginning to colour. Add the sliced onions and garlic and continue to cook for 5 – 6 minutes. Add the butter and when bubbling add the flour and stir well for a minute or two. Pour in the warm chicken stock and bring to a simmer, the sauce will begin to thicken, keep stirring until smooth and velvety. Add the cream and chicken and cook for 1 – 12 minutes over a low heat. Finally chop the cooked nettles and stir them in, along with some salt and freshly ground black pepper to taste. Remove from the heat and allow to cool. Grease and flour an 18cm spring form cake tin. Take ¾ of the pastry and roll out into a neat round about 4 – 5 mm thick. Carefully line the cake tin with the pastry. You should have a few cm over hang. Spoon the cooled chicken filling into the pastry case and level off. Roll out the remaining pastry to about the same thickness for the lid. Whisk the egg with a splash of milk to make an egg wash. Brush the egg wash around the lip of the pie, then lay the lid over the top. Trim off the excess using a sharp knife then use your finger to crimp the pastry together tightly. Make a small cut in the centre of the lid to allow the steam to escape as the pie cooks. Brush the surface with the egg wash and place in a preheated oven set to 170.c Cook for 50 – 60 minutes then remove. Undo the spring form tin and remove. Brush the sides of the pie with egg wash and return to the oven for 15 minutes. Once cooked allow to cool for 25 – 30 minutes before serving.